Do you have a new diner in your family? This is an interesting time. It’s also usually a stressful time as your baby’s nutrition and feeding just got a lot more complicated. When babies graduate to eating solids, many parents tend to concern themselves in the here and now. What many seldom realize is that early nutrition has a lingering impact on children’s health and their eating habits. If you want to raise a child with good eating habits and a positive attitude toward food, you need to pay special attention to what, when, where, why, and how you feed your baby. You’ll have to nit-pick every detail. Parenting is a meticulous job; that’s all there is to it. With the cultivation of young people at stake, it’s important to do things properly right away. When it comes to feeding a newbie diner, how do you do it so that you can meet the present requirements and deal with the current challenges while also keeping their future health and habits in mind? The following are useful tips to apply. For easier and more efficient feeding, you have to time it strategically. For the baby starting on solids, it should be after waking up, either in the morning or after a nap. You want him to be sufficiently hungry so he’s likely to be indiscriminate about replenishment. Make sure that there are no distractions so both of you can focus on his feeding. Turn off the TV, put away your phone, and, if possible, let your older kids stay in a different area of the house. 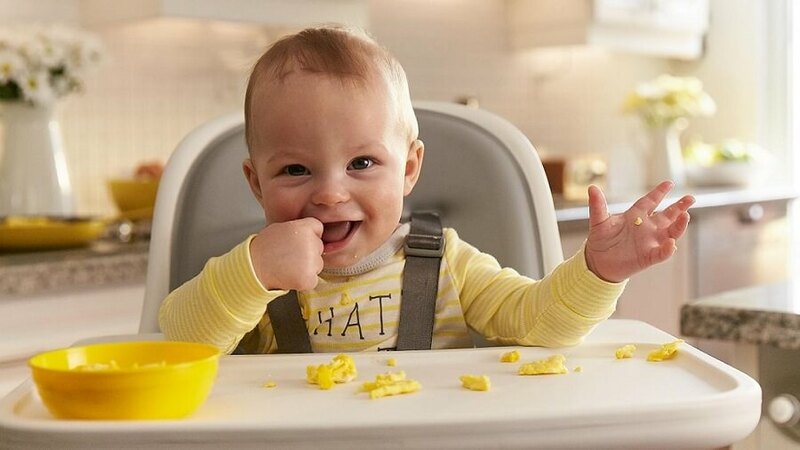 Upon new food introduction, expect your baby to take only a few bites. Do not force him to eat more than he wants to. To avoid waste, dole out just a small serving and prepare to freeze the rest if you’re doing your own baby food recipes. If you’re using a store-bought product, don’t feed right from the jar. You can easily add to the initial serving should your baby want more. The age-old advice is to stick to a single food for a few days to see how your baby reacts to it; however, there’s new advice from experts encouraging variety since the old style apparently breeds picky eating. Variety also means exposure to different flavors and consumption of a wider range of nutrients. Don’t be afraid to introduce stronger flavors either. Herbs and spices are nutritious too, and babies could enjoy them when given the chance to try them. Many tips for picky eaters you’ll see tend to lean towards coddling them and indulging their finicky behavior, but a different school of thought suggests that parents should stop underestimating their kids’ willingness and capacity to sample and accept variety. 3. Repeated exposure is key. Many parents are quick to note what their kids like and dislike. The thing about preferences, especially among very young diners, is that they tend to be fluid. If your child or baby has repeatedly refused to eat something, keep on serving it still. Children can be funny about food. They could like something now and detest it the following week, and vice versa. Also, experts say that it could take up to 15 exposures before a child accepts a new food. There’s no sense in acceding defeat. It’s an ongoing process. Refusal, even an oft-repeated one, is no reason to exclude any good food from your meals. 4. Creativity goes a long way. While you shouldn’t indulge your child’s picky eating by acting like a short order cook, you should also do what you can to make the food you serve more enticing. If you have the time and aptitude for it, you might want to dabble in some food art. That’s sure to get your child’s attention. If you can’t make monkeys out of pancakes or sprinkle an owl picture on oatmeal, then you can just use cute and colorful eating implements. 5. Broader food experiences increase interest. There are other ways for children to experience and connect with food. When your child is too young to help out with meal prep, you can build interest by teaching them to name foods. Later on, you can involve him in shopping, meal preparation, and even gardening. Better understanding of what’s in a dish, and how everything was made ready for consumption, increase interest. Participation in preparing it also makes children more invested in a meal. Giving your child a more in-depth experience of food does not only encourage him to eat better; it also enriches his knowledge and, possibly, hones his motor skills. You can teach your child something until you’re blue in the face, but what they’ll ultimately learn is what they observe from you. Not only do you want to avoid confusing your child with mixed messages, but you also want to serve as inspiration and role model. If you’re teaching them that they shouldn’t eat junk food, then they better not catch you having any. If they’re not allowed to watch TV or use a gadget while eating, then you better not be using your phone while eating. Do not think for one minute that your baby doesn’t see the double standard. Those young minds are like sponges. Your baby might not protest over it, but he’s learning what you’re teaching. Your example is a much stronger teacher than your words. While it’s true that you have to be on top of the situation with regard to your child’s early nutrition, it doesn’t necessarily mean that you have to be a nervous wreck over every demonstration of negative behavior. As long as you have your feeding principles and philosophies in place, and you know that you’re abiding by them, you can relax. There are other factors at play, like your child’s unique personality. It starts at infancy, but raising good eaters actually takes many, many years. Just stay the course and be consistent in your beliefs and rules. Trust that these will be ingrained over time.